The twin engine F5L, was also known as the Curtiss F5L, and as the civilian version Aeromarine 75. Part of the Felixstowe F series of flying boats jointly developed by the British and Americans during World War I, the F5L was an American built version of the Felixstowe F.5. 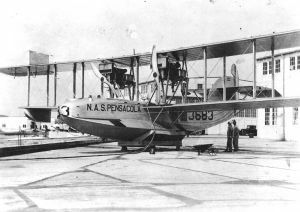 It only entered service at the end of the war and was the US Navy’s standard patrol plane until 1928, when they were replaced by the PN-12. The F5L was built by the US Naval Aircraft Factory (127) , Curtiss (60) and Canadian Aeroplanes Limited (30). Some were converted for civilian use by Aeromarine Plane and Motor Company in 1919. 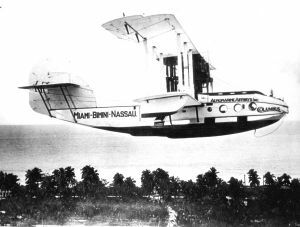 Named the Aeromarine 75, it could accommodate 10 passengers and was operated by Aeromarine Airways on flights from Key West to Havana, carring the first US Post office international air mail, on flights from New York to Atlantic City, and from Cleveland to Detroit. Aeromarine 75 on regular flights in the carrbean. This page was last edited on 6 March 2007, at 08:03.